The APSE event is held every year at the Hilton Hotel, Coylumbridge, Near Aviemore in the Highlands of Scotland. In recent years it has become one of the most important dates in the calendar for producers of wheelchair accessible mini and midibuses and this year was no exception. The event is built around a conference but the majority of the exhibition takes place outside which can be interesting from a weather point of view at this time of year. Over the years we’ve experienced everything from baking hot sunshine splitting the paving stones to snow; this year it was dull with a hint of rain and a very cold north easterly wind. 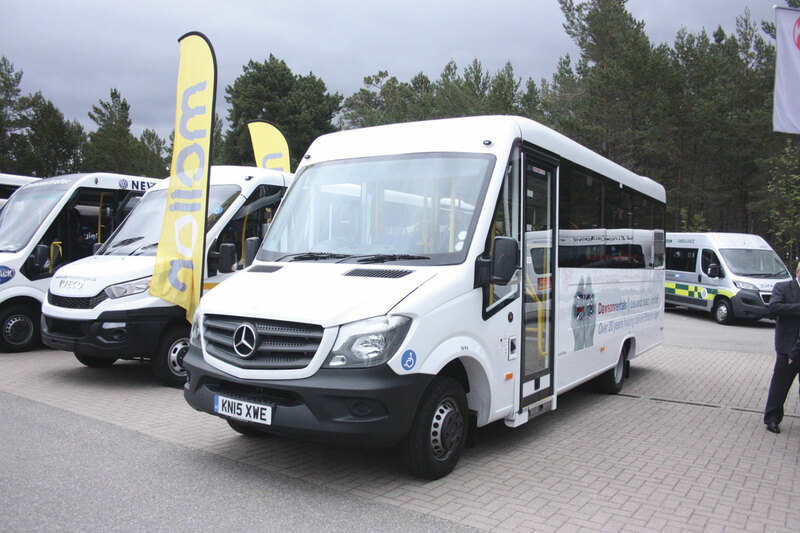 The event is attractive to exhibitors because it brings together local authority vehicle purchasers from across Scotland and the North of England as well as, increasingly, the service companies that operate many of these vehicles for local authorities. It gives the opportunity to meet a lot of potential buyers in a short space of time instead of having to cover huge mileages between appointments in order to get around this massive sales territory. The event was, as ever, very well attended by the industry, not only builders and converters, but also the component supply section. The John Clarke Group is one of the principal VW dealers in Scotland, particularly the East, where they have centres in Edinburgh, Dundee and Aberdeen. Scotland has always been a stronghold for the VW product particularly with local authorities. The John Clarke Group have for some years sold the flat floor directly wheelchair accessible minibus produced now by VDL in Holland, but originally developed and sold under the name of their subsidiary, Kusters. The vehicle is an up-to 16 seater built on either the five tonne VW Crafter CR50 or the five tonne Mercedes-Benz Sprinter and marketed as a CVI. Matt Stewart who oversees the model for the Clarke Group, told me that the wildly fluctuating value of the Euro was giving them some problems over supply but hopefully that situation will improve. 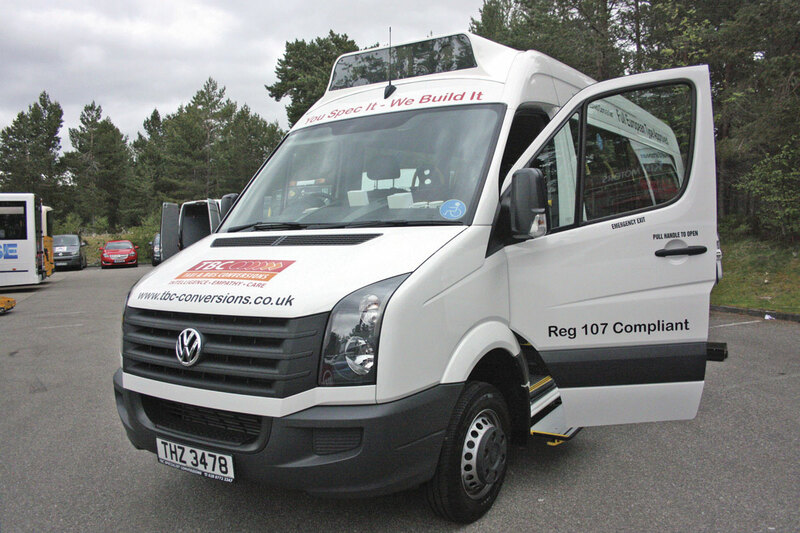 A VW Crafter CR50 accessible minibus by Stanford Coachworks sold through the John Clark Group to Perth & Kinross Council. Note the clever detailing that hides the accessible elements when it is working on private hire. Even the tail lift slots between the floors. Much more important to Matt in the association they formed some years ago with Stanford Coachworks to sell their diverse product range in Scotland. This association has proved very beneficial to both sides and the Stanford boys always fully support Matt at the event. Stanford’s celebrate their 25 years since Jess Rider and Lee Wiggins set the business up to become one of the nation’s top vehicle converters. 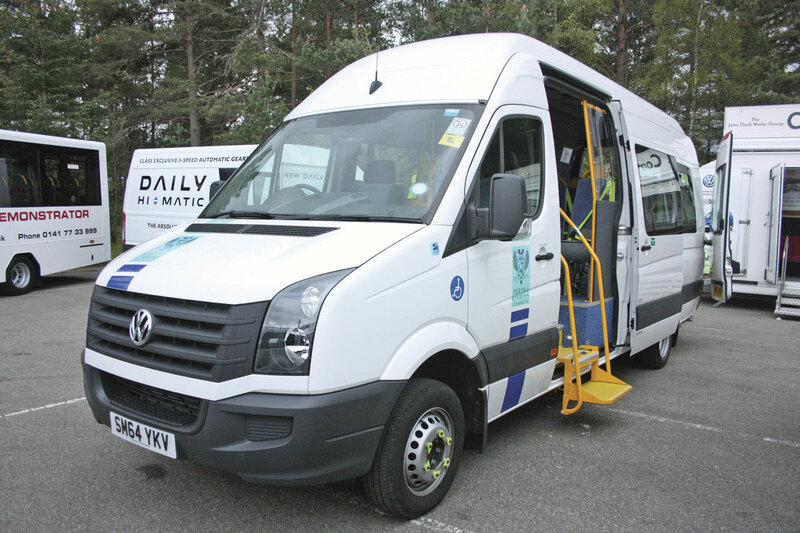 On show at the APSE event was a VW Crafter CR50 long wheelbase accessible minicoach for Perth and Kinross Council. 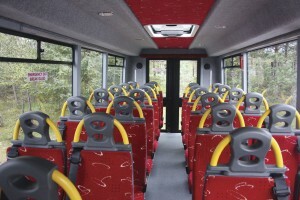 The vehicle was built to Stanford’s usual high standards and had been designed to fulfil accessible transport functions during the day but with a softness in the interior and with the seating and the clever masking of the accessible transport elements so that it could perform a normal private hire function in the evenings and at weekends. 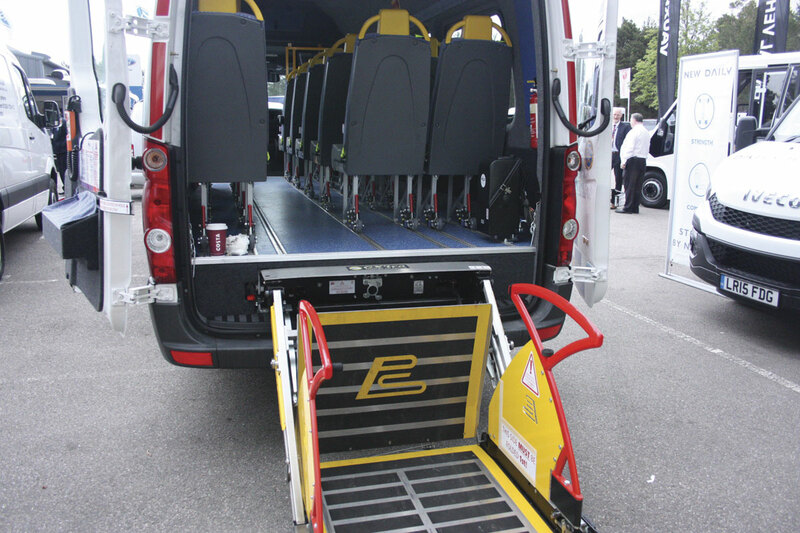 Typical was the PLS rear mounted wheelchair lift, which slots between the van floor and the flat internal saloon floor, thus keeping the lift out of the way of spray and road dirt and also ensuring that when stowed the lift was practically invisible. 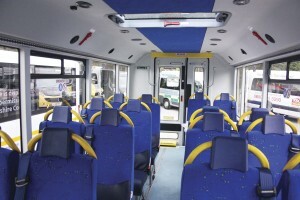 It could seat 16 passengers or alternatively carry up to five wheelchairs with two attendant seats. Fitted with a plug door and Stanford’s familiar fold out entrance step with handrails, it had Phoenix Hydra seats mounted on NMI quick release fixings and Unwin tracking. Heating was provided by Eberspächer D5 units and bonded glazing was installed. John Kerr of Glasgow is a new name to me but the man fronting their exhibit was not – John Stanton, previously of Verve. 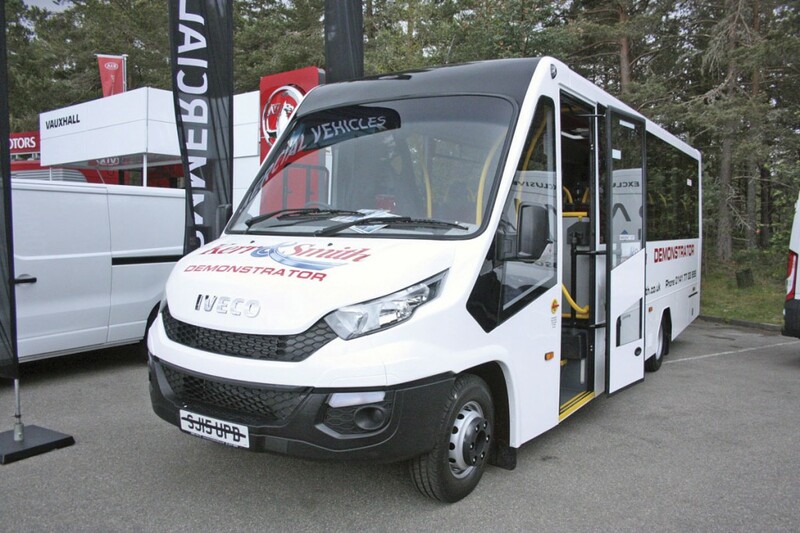 John Kerr is the Iveco dealer in Glasgow and through John they have teamed up with Nu-Track in Northern Ireland to sell a coachbuilt New Iveco Daily accessible minibus. The vehicle can carry up to 26 seated passengers using Rescroft SuperLite seats or alternatively six wheelchairs with two seated attendants. The vehicle has a flat tracked floor, wide entrance with plug door, bonded glazing and Eberspächer heating. At the rear it has twin access doors and a PLS underfloor mounted cassette tail lift. Apart from the John Kerr vehicle, Nu-Track had a major presence at the event with a further three very different exhibits. First up was an example of their new CityLift design which uses a VW Crafter CR50 long wheelbase chassis with manual transmission as a starting point. It has a rear axle uprated to 5.3tonnes which means the CityLift can carry up to 22 passengers using Rescroft UltraLite seats. 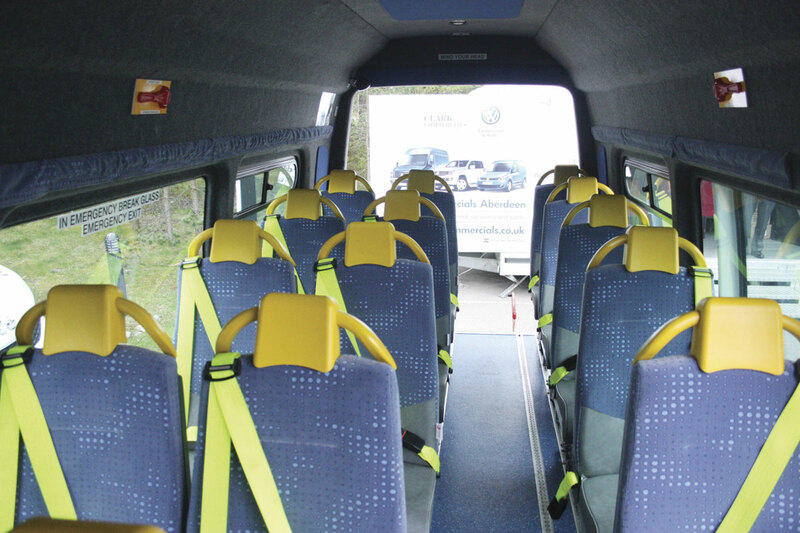 A plug entrance door, single bonded glazing and Eberspächer convection heating were fitted to the minibus demonstrated which was fitted with rear doors and a PLS underfloor cassette lift. 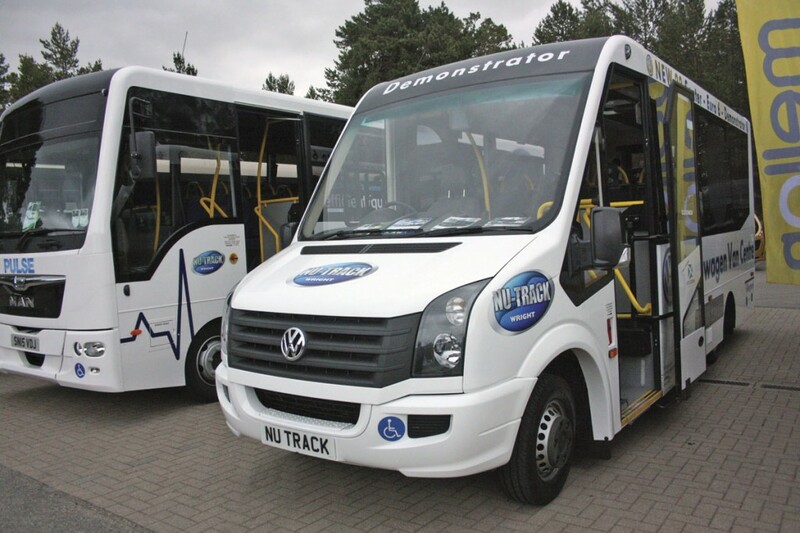 The project has been developed by Nu-Track in conjunction with Lookers, the VW dealer in Glasgow. The Nu-Track CityLift coachbuilt minibus on VW Crafter CR50 has a 5.3 tonnes rated rear axle. 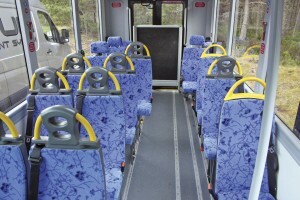 It can seat up to 22 or alternatively carry six wheelchairs and two seated passengers. Talking to them I learned that a new version of the VW T5 Transporter, very popular for small conversions, is about to be announced. Called, not surprisingly, the T6, it will have Euro6 engine availability. I also learned that a revamped Crafter is on its way with Euro6 power. It is due around the end of the year but more likely first quarter 2016. It is to be built in Poland following the Mercedes-Benz decision to cease producing Crafters for VW. 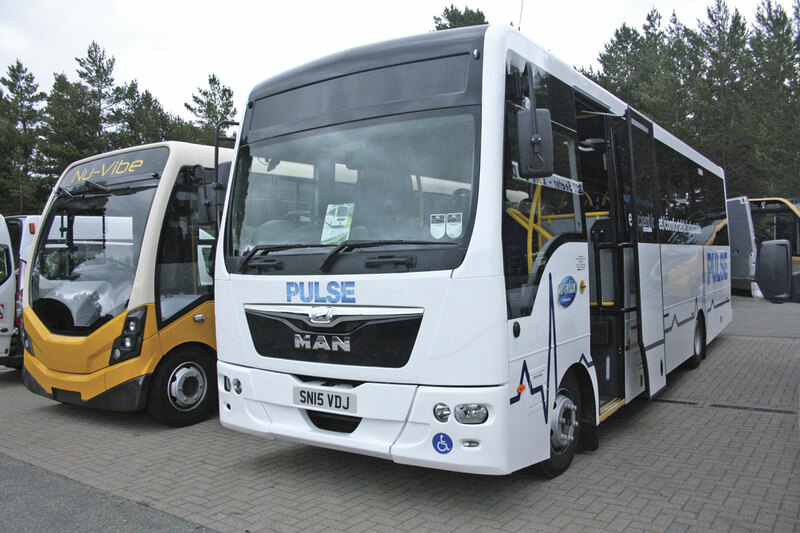 Alongside the VW was the largest accessible bus at the show, an example of the Pulse introduced last year. The Pulse was developed on the MAN forward engined truck chassis initially as a school bus, primarily for schools in Northern Ireland, but it soon produced calls for an accessible version which Nu-Track already had in the pipeline. They have gone on to supply quite a number of these accessible versions, particularly to London local authorities, who have long used this class of vehicle extensively. The biggest bus at the Show was the Nu-Track Pulse accessible. 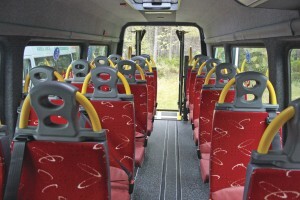 It carries 34 passengers or up to eight wheelchairs and eight seated passengers. Wheelchairs are loaded at the rear. 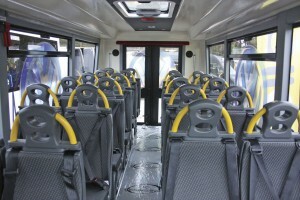 Showing the flexibility that attracts the London authorities, the exhibit had seating for 34 using Rescroft seats but alternatively can carry up to eight wheelchairs and eight seated passengers. It was fitted with a plug door, bonded glazing, tracked floor with all seats on quick release fixings, Eberspächer convection heating and air conditioning from the same company. The full length rear doors are used for loading wheelchairs using a PLS underfloor mounted cassette type tail lift. The last exhibit was a production version of the Nu-Vibe design which has been flagged at a couple of previous shows. The vehicle utilises the technology of sister company Wrightbus, particularly the StreetLite design. It has a low-line aluminium alloy chassis structure giving the vehicle a flat floor at the front and direct wheelchair accessibility via a wide entrance with plug door. A rear mounted Cummins engine/Allison transmission drive line is installed. 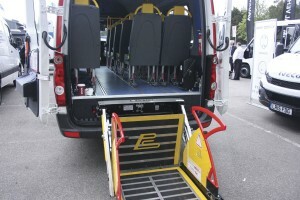 The Nu-Track directly wheelchair accessible Nu-Vibe developed using Wrightbus technology. 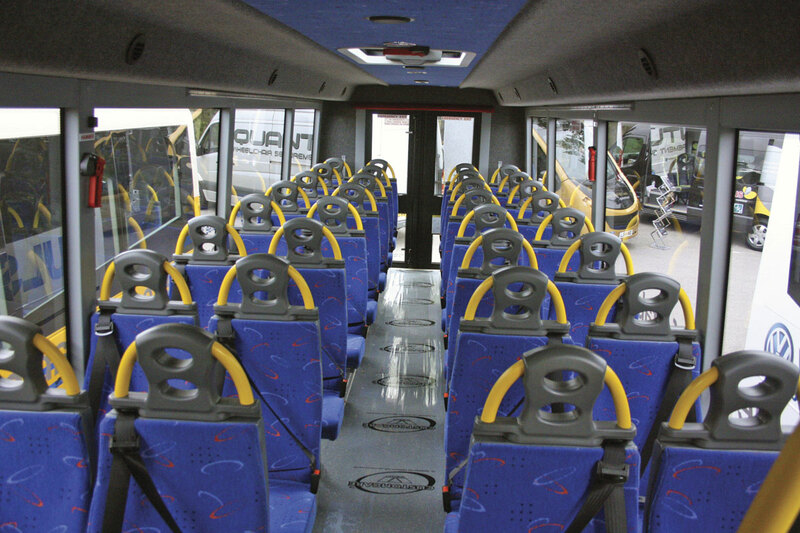 It can carry up to 33 seated passengers or alternatively the low floor area can be used for wheelchairs. It has an attractive width of 2.278m making it ideal for rural operations. 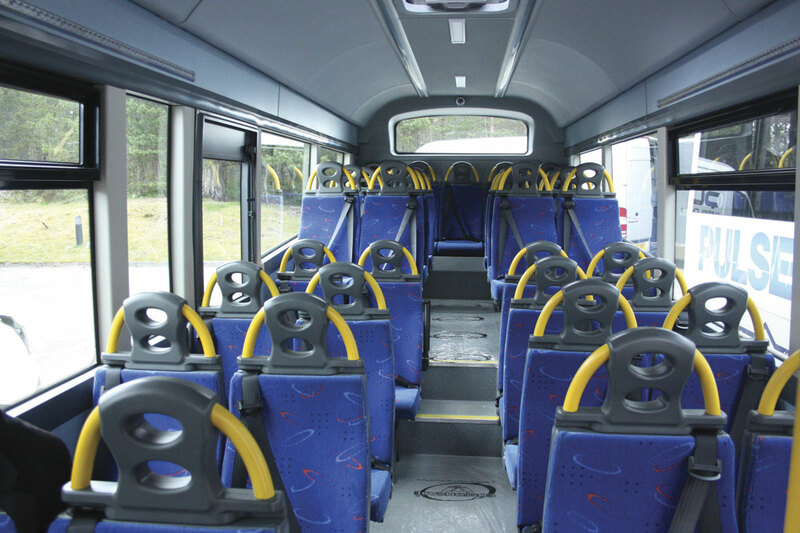 The front low floor section has a maximum seating capacity of 16 when not carrying wheelchairs, whilst the upper saloon, accessed by two steps, seats 17. The seats are Rescroft mounted on Unwin tracking with NMI Quick release fixings and there are two Eberspächer D5 convection heaters and bonded glazing. 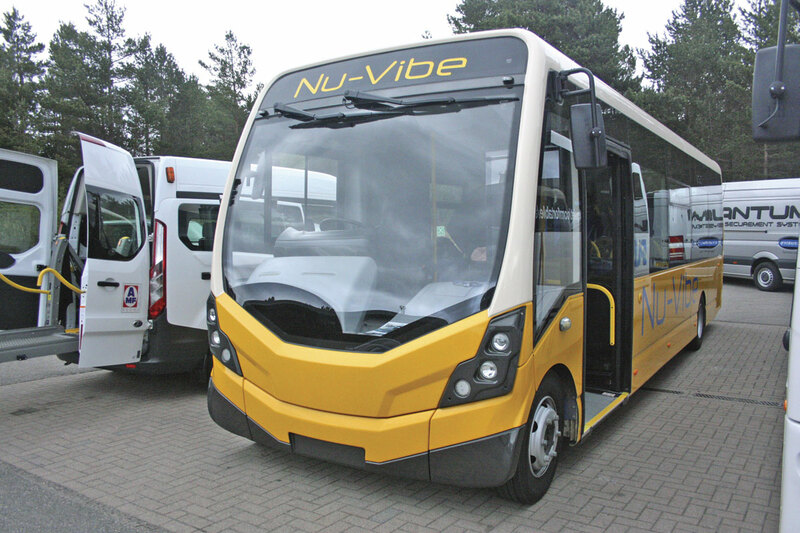 A major feature of the Nu-Vibe is that it is only 2.278m wide making it attractive to operators looking for a suitable vehicle to operate rural services. Treka Bus Treka 16 accessible minibus on Mercedes-Benz Sprinter 513, one of 55 being built for DawsonRentals. It features Phoenix Hydra seats. Treka Bus showed one of their popular accessible Treka 16s built on the five tonne Mercedes-Benz Sprinter 513 with fully automatic transmission. Shown was one of an order for 55 they are currently supplying to DawsonRentals. 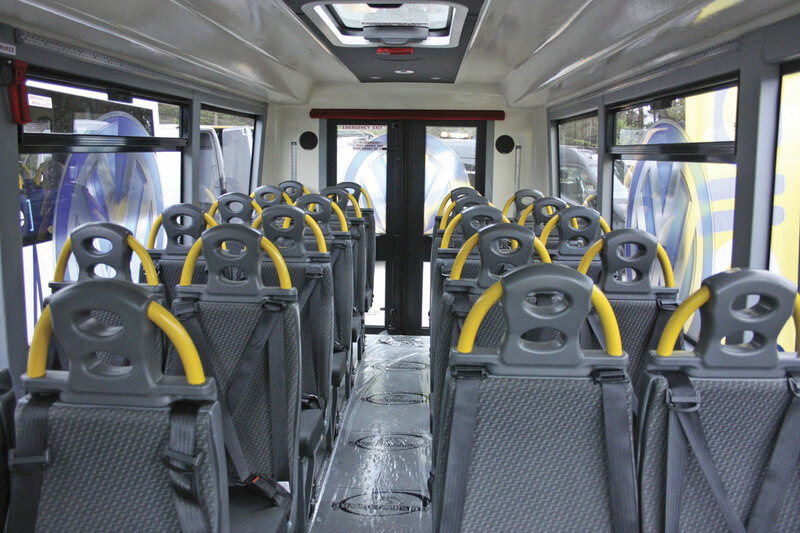 Fitted with 16 Phoenix Hydra seats with tip ups in the rear to create wheelchair space, it can alternatively carry up to six wheelchairs with two seated attendants. Seating is all track mounted with NMI quick release fixings. Other features are Treka’s fold out extra entrance step, bonded glazing, convection heating and at the rear a PLS underfloor cassette lift for wheelchair loading. Mellor have long had a strong presence in Scotland where their coachbuilt conventional accessible minibuses are popular. 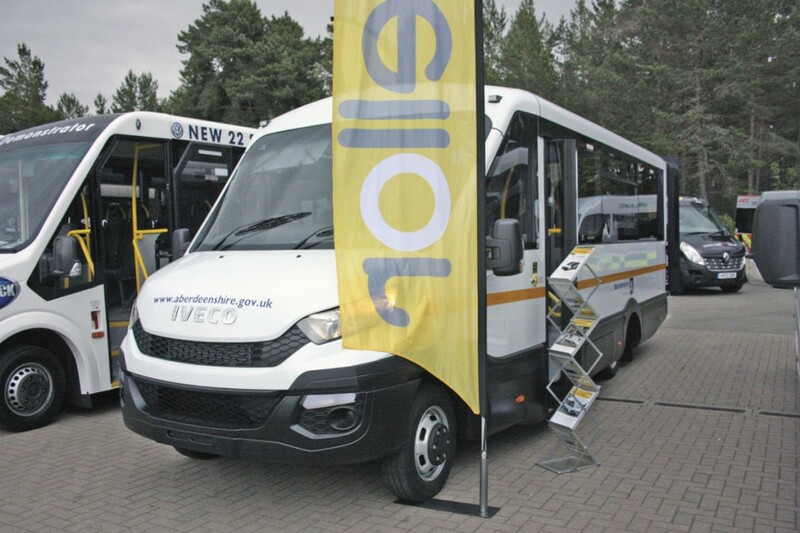 Exhibited was an example of the Iveco New Daily, the first that Mellor have built. It was a manual version from an order for five for Aberdeenshire Council. A coachbuilt Iveco New Daily by Mellor Coachcraft. 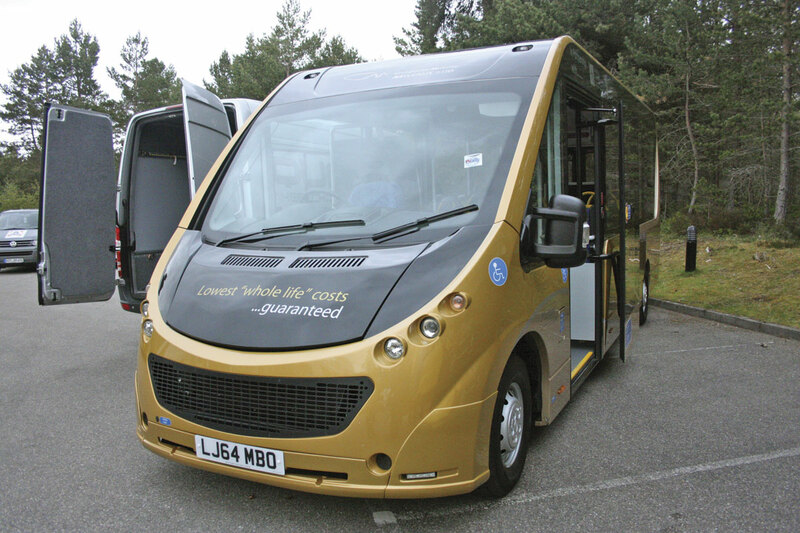 One of five for Aberdeenshire Council, it can carry up to 16 seated passengers or up to six wheelchairs with two seated passengers. Incorporating Mellor’s fold out step design at the plug door equipped entrance it has bonded glazing, convection heating and seating for 16 on tracked, flat floor with quick release seat fixings. 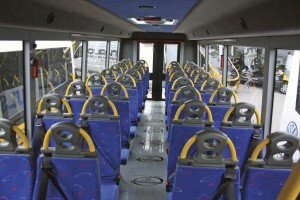 Seating was Phoenix Hydra with tip ups in the rear to create the wheelchair spaces. 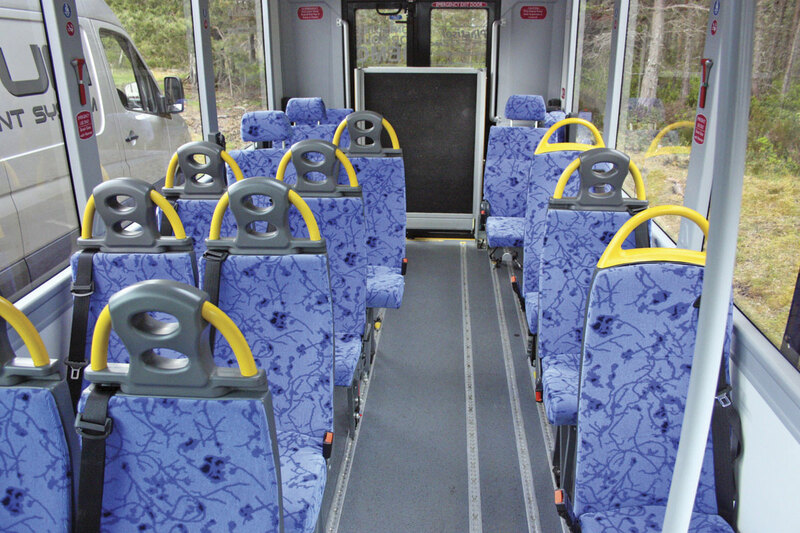 16 seated passengers can be carried or alternatively six wheelchairs and two seated passengers. Wheelchairs are loaded through the full height rear doors using a Ratcliff-Palfinger underfloor cassette lift. I think it is fair to say that the Plastisol directly wheelchair accessible minibus has had something of a chequered career so far, is that about to change? The design, which features a completely integral plastic body attached to a Fiat Ducato Maxi front end and using a Fiat Ducato rear axle mounted directly to the body was developed in Holland. It was initially being marketed by Optare as the Bonito but that project never really got off the ground and it is now being solely marketed by Plastisol UK as the Mission. The Plastisol plastic bodied Mission directly wheelchair accessible minibus. It is fitted out by O&H and is available with either diesel power or full electric drive. The Mission’s great selling point is that when the chassis section becomes out dated, the body can simply be taken away from the mechanical components and fitted to new ones. Plastisol costings show that to carry out this exercise including a full renovation of the body interior would result in an overall purchase price for the essentially ‘new’ vehicle of between 50 and 75% less than a conventional new vehicle. Two versions of the Mission are produced, one powered by the Ducato’s Maxi 3.0 litre diesel or alternatively it is available in full electric powered form. 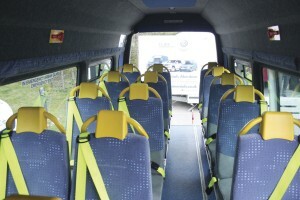 Fitting out of the bodies is carried out by O&H on whose stand the minibus was shown. 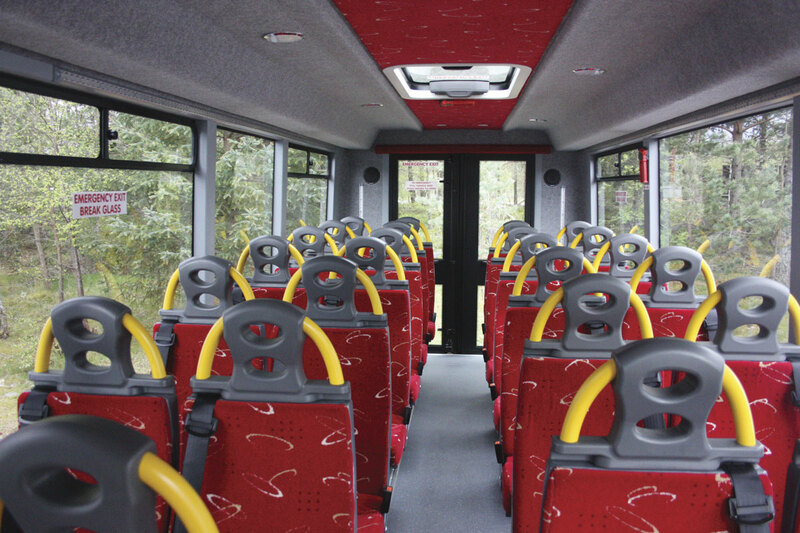 It seats 16 passengers when not carrying wheelchairs using Rescroft seating and is also fitted with bonded glazing and convection heating. Plastisol are in the process of supplying 12 diesel powered units using the Peugeot Boxer drive package to South Lanarkshire and have also secured their first orders for the electric powered version. TBC from Bush in Northern Ireland have been stepping up their push to secure wider sales in the UK mainland following the appointment of Joanne Campbell, the lady originally responsible for getting Nu-Track a foothold in the area. On show they had a VW Crafter CR50 manual. This had a cab style entrance with extra step. Inside there was a flat tracked floor fitted with 16 seats. It could alternatively carry six wheelchairs and two seated passengers. Bonded glazing, two glazed roof hatches and Eberspächer convection heating also featured. At the rear were full length access doors allowing the in-board Braun tail lift to be used to load wheelchair passengers. TBC’s conversion of the VW Crafter CR50. 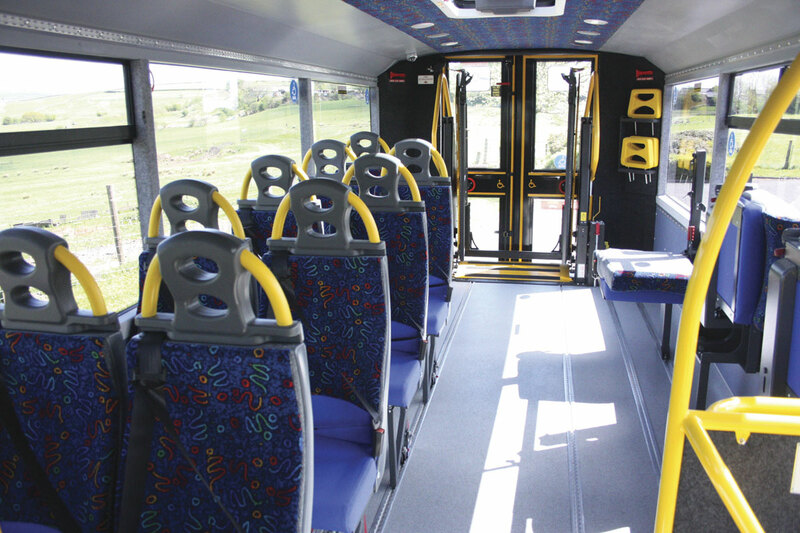 It can carry up to 16 seated passengers or alternatively six wheelchair passengers loaded through the rear doors. Apart from its involvement with Plastisol, O&H also featured a product from one of its main market sectors, PTS ambulances. Built on a Peugeot Boxer, this was a special unit for the Yorkshire Ambulance Service with seating for just two patients plus two attendants. 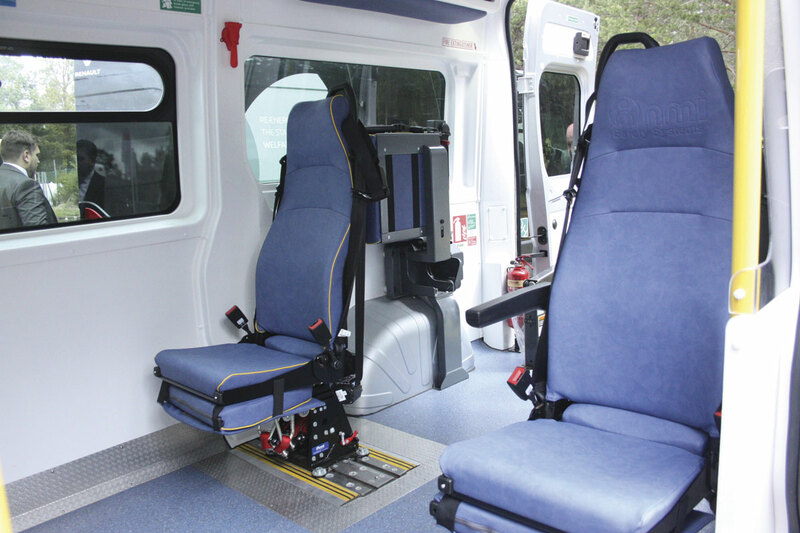 The clue to its use was the two main seats, large sized units mounted on the NMI King RIPS fully moveable system, as it is for moving bariatric patients, hence the adjustable seating positions. It is complemented by a 500kg PLS Bariatric tail lift mounted at the rear underfloor. A specialised PTS ambulance built by O&H to carry Bariatric patients. Note the use of the NMI King RIPS seating. It also has a 500kg PLS tail lift. As ever, the event was well supported by the supply industry. Among the exhibitor were: AMF Bruns with their range of lifts, Smartfloor and other componentry; Phoenix Seating with examples of the Shuffle seat that tips up and slides along the track avoiding the need to physically remove seats to create wheelchair space; Q’Straint; Koller; Unwin; Brigade Electronics; Northgate Vehicle Hire; Cogent Seating and Rescroft Seating. As ever at these events it is the networking that really scores and APSE is great for that because people have time to talk and aren’t under the same time pressures of larger shows. The APSE event proved to be well worth the visit with plenty of interesting vehicles on show and some fascinating developments showing that this sector, despite the knocks inflicted on it by the recession, remains very resilient. Long may that continue.